Eventbrite has launched its new app marketplace with over 100 vetted apps for event creators. All of the apps featured in the new Eventbrite App Marketplace work within the Eventbrite platform. Event creators can extend and tailor their event using these apps to create a better end-user experience. says the new App Marketplace is the next iteration of Eventbrite Spectrum. Gift Up! – A new way for creators to sell gift cards on their website or for events listed on Eventbrite. Constant Contact – Build professional emails, promote events, track registrations, and send follow-up emails to attendees with the help of Constant Contact. It features a variety of robust email templating options and a drag-and-drop email creator. Lennd – Lennd helps event creators manage credentials and ticket requests for vendors, sponsors, artists, media, and staff. Special requests and approvals to the event can be handled with ease. Prism – Prism simplifies the process of booking live music and comedy shows, managing rooms, and tours. In addition to these integrations, the Eventbrite app marketplace also supports Facebook, MailChimp, ToneDen, HubSpot, and Survey Monkey. Eventbrite says that beyond the fresh coat of paint, the interface has been re-designed from the ground up. It is now easier for creators to discover apps. Revamped documentation and guides now make it easier to find help, which is a boon to those new to digital event organization. Event organizers and creators can now custom-tailor their event, which helps events create custom registrations. The new changes to the marketplace should make it easier to use Eventbrite with other services. That’s mostly thanks to the Eventbrite API, which allows integration with multiple third-party platforms. So far, app developers have found the API to be well-documented with good support, which means easy integration with other apps. Florida State prosecutors plan to seek the death penalty against rapper YNW Melly for double homicide. The rapper’s lawyer, Jason Roger Williams, says the prosecution has indicated it would seek the death penalty since the beginning of the case. The prosecution will present evidence at a discovery hearing for the case later this week. Earlier this year, YNW Melly (real name Jamell Demons) was arrested and charged with two counts of first-degree murder. Prosecutors say the rapper and his comrade, YNW Bortlent (real name Cortlen Henry), killed two members of the YNW crew in South Florida. The two slain members of the YNW crew were victims of an apparent drive-by shooting on December 4th. Later, police revealed that this was likely a fabrication. YMW Melly has pleaded not guilty to all charges. His family and fans have been leading an effort to get Melly released. The 19-year-old SoundCloud rapper first released We All Shine in January of this year, his debut album featuring Kanye West. The rapper’s biggest hit was his 2017 single “Murder on My Mind,” which recently went gold and is trending towards platinum. The acronym is short for ‘Young Ni**a World’ and includes several other rappers. Occasionally, Melly has said the acronym stands for ‘Young New Wave’ to avoid being censored on TV. On February 25th, police cited phone records that confirmed Melly was at the scene of the crime. On March 6th, Melly entered his plea of not guilty. YNW Bortlen is accused of attempting to cover up the deaths as a drive-by shooting. 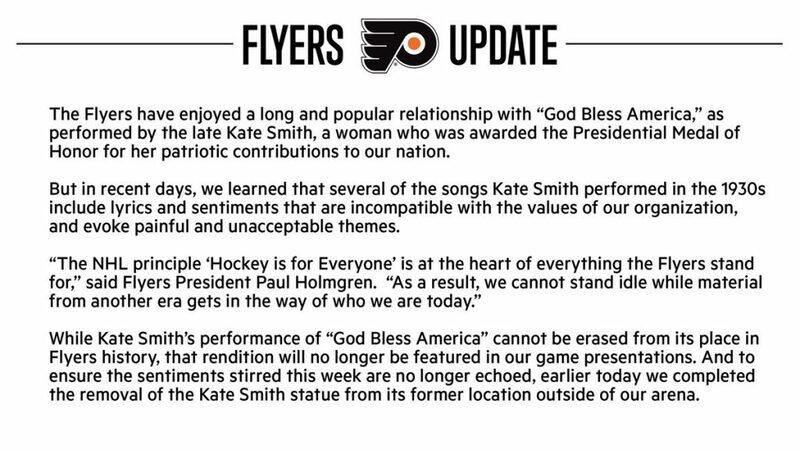 The Philadelphia Flyers have removed a statue of Kate Smith and will no longer play the singer’s rendition of ‘God Bless America’ at games. The move comes after racially insensitive songs performed by the singer more than 90 years ago resurfaced. The Philadelphia Flyers released an official statement on their decision, saying it was the right move. The racist songs were recorded in the 1930s and included “Pickaninny Heaven” and “That’s Why Darkies Were Born.” The songs in question include several lyrics that are very racially insensitive. After the controversial recordings were unearthed last week, several sports organizations have dropped Smith. Her famous recording of “God Bless America” has been in use at Flyers’ games since 1969. When she died in 1986, the team had a statue erected in her honor. That statue is now removed. Smith sang her rendition of ‘God Bless America’ live for The Flyers over several decades, including the team’s 1975 Stanley Cup win. The New York Yankees also suspended their use of the song after the controversial recordings surfaced. Smith’s family is asking The Flyers to reconsider their decision to remove the statue and song. They say their aunt is an important part of their the Flyers’ history. Indio, CA – Kid Cudi was a Good Samaritan during his time in Indio, California, which hosts the annual Coachella Valley Arts and Music Festival. The Grammy Award winner spent some of his hard-earned money to provide meals to people in need on Friday night (April 19). According to TMZ, Cudi bought Popeye’s chicken, biscuits, fries and mashed potatoes for the homeless at the Coachella Valley Rescue Mission. In total, he spent $10,000 on the food. Cudi had Postmates, which he recently teamed up with for a Munchies Menu collection, deliver the large order of Popeye’s to the homeless shelter. Video of the delivery can be seen below. This past weekend, Cudi performed at Coachella as part of a Saturday night set (April 20) that featured a surprise appearance by Kanye West. He returned the favor for his Kids See Ghosts collaborator the next day, joining Yeezy for the Easter edition of Sunday Service. For more information on the Coachella Valley Rescue Mission, visit its official website. Detroit, MI – FMB DZ is the latest buzzing rapper coming out of Detroit. His 2018 project The Gift 2 made a huge splash and today he’s delivering the music video for the project’s track “Loyalty,” directed by Hustleberry Fin and Keefer Khan. DZ takes viewers inside his mind while he deals with some troubling relationship drama, as heard in the song. The Motor City native performed at HipHopDX’s Detroit Invasion showcase at this years’ SXSW in Austin, Texas. FMB DZ revealed in an interview with Hypbeast that The Gift 2 tracks “Windsor” and “Big Unk” have visuals coming real soon, as well. He’s also working on a project to be released on his birthday, July 13. Watch FMB DZ’s music video for “Loyalty” up top. New York, NY – DMX is ready to resume his acting career. The multi-platinum selling artist has been cast in a new film titled Chronicle Of A Serial Killer, according to HotNewHipHop. X will play Detective White, one of the lead detectives attempting to track down a serial killer. The movie is being directed by Steve Stanulis and begins shooting in June. X got his start in acting by portraying Tommy “Buns” Bundy in the 1998 cult classic Belly. He later starred in major films such as 2001’s Exit Wounds and 2003’s Cradle 2 The Grave. The Ruff Ryders rapper has been on the comeback trail since getting out of prison in January. The veteran MC is currently touring in celebration of his debut album It’s Dark & Hell Is Hot’s 20th anniversary. He’s also been back in the studio with Swizz Beatz and making appearances at Kanye West’s Sunday Service events, including the Easter edition at 2019 Coachella Festival. The Recording Academy has declined to lend its endorsement to an MLC bid from major publishers like Sony/ATV, UMPG, and Warner/Chappell. The following is a developing story; please check back for continued updates. Last update: Monday, 3:00 pm PT. Instead, the Academy, which oversees the annual Grammy Awards, has indicated that it will withhold its support pending further scrutiny of competing MLC bids. The major music publishers’ submission to oversee the Mechanical Licensing Collective (MLC) faces competition from a rival group of indie songwriters and technologists known as the American Music Licensing Collective (AMLC). That group has argued that major publishers are seeking to exploit the MLC to claim billions in ‘black box’ royalties that belong to indie songwriters. According to the language of the Music Modernization Act, now signed into law, the elected MLC will have roughly one year to clarify a tranche of unidentified royalties. If unidentified, the first tranche — which is estimated at more than $1 billion — will be liquidated based on publishing market share, regardless of who the actual rights owners are. That payout scheme has been criticized as heavily advantageous to major publishers, though extremely unfair to smaller rights owners. Initially, the influential Recording Academy appeared to wholeheartedly back the major publishers’ MLC submission. But the Academy’s name was notably absent from the publishing group’s formal proposal with the U.S. Copyright Office. Instead, the group has opted to withhold its endorsement for now, while studying the nuances of both proposals. “The Recording Academy has an obligation to its songwriter members to study both submissions for the new Collective carefully and with due diligence,” Daryl Friedman, the Recording Academy’s Chief Industry, Government and Member Relations Officer emailed Digital Music News this afternoon (April 22nd). It should be noted that the email was also sent on April 22nd (Monday), ostensibly prior to the Academy filing its official comments with the U.S. Copyright Office. That open comment section is being closed on April 22nd, and at the time of writing, we have not seen the Recording Academy’s comments on the various proposals. Late last week, sources to Digital Music News noted that the Recording Academy’s name was missing from the official MLC submission of the major publishers. David Israelite, who heads major publishing trade group NMPA, did not respond to a request from Digital Music News for comment. Charlotte Sellmyer, Senior Vice President of External Affairs at NMPA, also declined to respond. The Recording Academy’s pullback comes as a blow to the NMPA and its major publishing constituents. The Academy is easily one of the most influential trade groups in the music industry, and certainly the most visible with the Grammys. The group’s pullback could deflate earlier claims by the NMPA that its MLC proposal solidly represented an ‘industry consensus,’ a talking point used heavily by Israelite and others. “No matter how you want to identify what the majority of music works means, the number of songs, the number of owners, the amount of money collected, the Billboard charts — anyway you cut it, these endorsements far exceed the majority status,” Israelite declared to Billboard. Indeed, Israelite argued that the NMPA’s MLC submission was so heavily supported that a bidding process involving the AMLC was completely unnecessary. Those claims now seem unwarranted given the Recording Academy’s position. The AMLC has countered Israelite’s claims by noting that the real ‘consensus’ comes from smaller songwriters and publishers, a group that easily overpowers the smaller cadre of major publishers and their allies. Other MLC supporters remain, including the influential Songwriters of North America (SONA). But even SONA is experiencing some fallout: just last week, SONA founding member Hélène Muddiman . South Korean boy band BTS have claimed the No. 1 spot on the Billboard 200, but Hip Hop and R&B dominate the Top 10 with seven entries this week. Anderson .Paak’s Ventura debuts at No. 4, marking a new career-high for the Aftermath Entertainment artist. Meanwhile, Beyoncé’s Homecoming: The Live Album has managed to hit No. 7 despite only being tracked for two days. Elsewhere, Khalid’s Free Spirit slips to No. 3 following last week’s chart-topping debut. Nipsey Hussle’s Victory Lap also continues to perform well, remaining in the Top 5 for its third consecutive week. Ventura has become the highest-charting album of Anderson .Paak’s career thanks to a No. 4 debut. The Grammy winner had never been in the Top 10 prior to Ventura, peaking at No. 11 with last year’s Oxnard. In its first week, Paak’s latest album moved 55,146 total album equivalent units. 38,548 of those came from pure album sales. Beyoncé didn’t even need a full week to attain the No. 7 spot on the Billboard 200. The R&B superstar’s Homecoming: The Live Album racked up 37,737 total album equivalent units — 14,498 of which were pure album sales — during two days of tracking activity. Queen Bey surprised fans last Wednesday (April 17) by dropping the 40-track live album. The project was released as a companion piece to her Netflix documentary Homecoming, which premiered that same day. The death of Nipsey Hussle has prompted a dramatic increase in his album sales and streams. For this week’s Billboard 200, Neighborhood Nip’s Victory Lap settles in at No. 5 on the chart. Victory Lap, which was released in February 2018, re-entered the Billboard 200 earlier this month at No. 2. After slipping to No. 3 last week, it’s fallen a few more spots but remains in the Top 5 after selling 54,711 total units. Follow these tips and win. George Goodrich of Playlist Push has witnessed thousands of successful Spotify playlist campaigns. He partnered with Digital Music News to share the most important tips he’s learned. (1) Write long albums with short songs. Rappers like Drake have turned this technique into an art, with albums loaded with lots of shorter tracks. And he isn’t alone. The strategy generates far more plays, thereby ensuring a top-charting album while multiplying per-stream revenue. For developing artists, the strategy also increases the odds of landing on big playlists — while also increasing positive metrics around songs (more on that later). Fact: Spotify doesn’t pay for any song that gets skipped before the 30-second mark. But this goes beyond the simple payment. (3) Songs are getting shorter — so think about length. Lil Nas X’s ‘Old Town Road’ is just 1:53, the shortest chart-topper since 1965. And that’s hardly the exception: Lil Pump’s ‘Gucci Gang’ is just 2:04, while Kodak Black’s ‘Calling My Spirit’ is 2:32. Songs are definitely getting shorter, and Goodrich says the reasons are simple. People are more distracted, and shorter songs grab people faster and reduce the chances of skipping. They also result in bigger payouts for artists (see #1). Goodrich told us that clever artists are now re-releasing older tracks, with the same ISRC code and previous playcounts. “Artists that are smart are repacking singles into albums or compilations,” Goodrich said. The repackaging pushes the ‘brand-new’ tracks with lots of plays into ‘new’ algorithm playlists like Discover Weekly, New Music Friday, and your followers’ Release Radar. The refresh can result in a surge of new interest for an older cut. (5) Use Spotify for Artists — correctly. Most artists are doing Spotify for Artists wrong — and that dramatically reduces their chances of playlist inclusion. The number one mistake: artists should be uploading tracks into Spotify for Artists at least 7 days before it hits the platform. Otherwise, the track isn’t guaranteed to hit your followers’ Release Radar playlists, which means that all of that free promotion is lost. “A lot of artists are gunning down playlists but don’t even have access or utilize Spotify for Artists,” Goodrich said. (6) Be nice to your distributor — you need them more than they need you. Stop bitching at your distributor and start working to become their favorite artist. (7) Own your genre — or pioneer your own. Hip hop is huge, but other genres are also generating lots of money on Spotify. Overnight, bedroom producers are minting cash on platforms like Lo-Fi Beats, and they don’t even have to tour. But that’s just one playlist catering to a growing class of people using music to focus better. “Thanks mainly to the startup world and people just trying to focus better at work, stripped down repetitive beats are the top choice when it comes to writing or doing detailed technical work,” Goodrich said. (8) ‘Going viral’ is a fool’s errand — think long term, release lots of songs, and develop long release schedules. Songs still go viral occasionally, but ‘going viral’ isn’t a good strategy. “In order to get noticed and get on Spotify playlists, most artists think they need a hit or just one banger to put them on,” George said. (9) Try to establish a direct connection with a Spotify curator. Yes, you can directly connect with Spotify curators if you’re lucky. No, you cannot do this by spamming them constantly. George recommended LinkedIn as a good place to start finding curators. Try starting here. Just make sure to target the right person for your genre (i.e., don’t splatter-spam). It’s time-consuming and not guaranteed, but the right connection can result in a plum playlist add. “If you do choose to go this route be polite in your messaging and don’t expect them to respond instantly,” George said. (10) Pay attention to cover art. Album art isn’t a lost art — even though it’s a tiny thumbnail these days. “Visual should not be an afterthought,” George said, while urging artists to imitate the artwork of releases from successful artists. But don’t go crazy on a thumbnail — just make it high quality and fun. “Don’t spend $5,000 on a designer,” George laughed. (11) Obey the simple rule of thumb: engagement is good, disengagement is bad. Nobody knows Spotify’s exact algorithms for rating a track. But some basic principles apply. Anytime a listener saves a song or adds it to a personal playlist, that’s good and shows positive engagement. Anytime they skip it or remove it, that’s bad because it indicates disengagement. Keep this basic guideline in mind. Artists with lots of Spotify followers are “guaranteed playlist real estate,” according to Goodrich. The reason is that anytime an artist releases new music on Spotify, it automatically populates the customized Release Radar playlist of every follower (just make sure you’re releasing properly through Spotify for Artists). That doesn’t guarantee placement on a top playlist, but it builds a lot of momentum. (13) Start big, end big to reduce skipping. Artists like Kodak Black immediately hit you with the hook to grab your attention. But Goodrich is noting another trick: a lot of artists are now ending with the hook to keep listeners attentive. Slower fade-outs and energy drops can lead to late-stage skips — which can result in negative strikes (see #11). (14) Avoid long intros and slow builds. More often than not, long intros kill placements. So it’s better to avoid them. “There are long intros that work, but if you want to really crush it on Spotify, long intros aren’t the way to go,” George told us. (15) Off-Spotify popularity helps, too. Artists with weak Twitter and Instagram followers can have difficulty gaining traction on Spotify playlists. “It’s all relevant,” George explained, while noting that he politely guides artists with IG followers under 300 back to their SoundCloud accounts. But beyond social networking, there’s also Google SEO to think about (SEO stands for ‘Search Engine Optimization,’ and basically refers to your Google search ranking). For example: is your song appearing in the first page of Google results, and preferably, is it one of the top, above-the-fold results? Remember: Google owns YouTube, so a YouTube result with good track metadata and information will often bubble to the top. “If the song’s performing well, it can go into feeder playlists like Fresh Finds, and then an actual human at Spotify may listen to it,” George explained. And another pro-tip: George also advised shouting out Spotify in tweets, IG posts, and Facebook blasts. They just might notice. (16) Should you get signed? A note on the power of major label representation. It’s hard to say exactly what transpires between major labels and Spotify. Major labels oftentimes have serious sway with Spotify, but George warned us that this really depends on the specific label. In many cases, however, the impact can be dramatic. Beyond pulling favors and blasting Drake-style promotions, major labels are oftentimes experts in crafting streaming-friendly songs. “They know how to create and craft songs,” George said. Hopefully these tips were helpful! Happy playlisting. DeKalb County, GA – Hours before the Easter holiday began on Sunday (April 21), 23 nonviolent inmates at DeKalb County Jail were released. Why? T.I. decided to help post bail for all of them, according to Fox 5 Atlanta. Gordon was one of the 23 people bailed out by the “Bail-Out” program sponsored by New Birth Missionary Baptist Church, Tip and Love & Hip Hop: Atlanta personality Scrapp Deleon. At the beginning of Lent, the church set a fundraising goal of $40,000 but 40 days later, had reeled in over $120,000. Subsequently, seven women and 16 men were brought home to their families just in time for the Easter holiday. In addition to the initial assistance getting out of jail, New Birth is connecting each individual with a mentor for weekly check-ins. They’re also using a portion of the donations to kickstart college funds for the children of returning citizens. New Birth senior pastor Dr. Jamal Bryant was thrilled to see the church community take action for their fellow DeKalb, Fulton, Gwinnett and Rockdale county citizens. No, drunk festivalgoers can’t sue Live Nation nor concert venues for breaking a bone after a heavy day of drinking. Good news for Live Nation. A Michigan court of appeals the promoter, along with Michigan International Speedway (MIS), can’t be held liable for an intoxicated concertgoer who broke her ankle following a music event. Three years ago, Brandi Roe and her friends attended the Faster Horses Country Music Festival. Following an admitted ‘day of drinking’ – including heavy beer and mixed vodka – she left the music festival at the end of the night. Roe had followed her friend, who had gone into an adjacent “dark, wooded area to relieve himself.” Once the unnamed companion called out her name, asking for help, she went off the well-lit pathway. After taking two steps into the wooded area, Roe fell down a ravine into a creek bed, breaking her ankle. In her initial lawsuit, Roe claimed Live Nation and MIS knew about the “steep drop-off” in the wooded, unlit area. Citing an earlier case, she claimed the landowner has the duty to invitees to exercise reasonable care and protect them from an unreasonable risk of harm caused by a dangerous condition on the land. This danger, Roe argued, was “open and obvious.” Yet, both the promoter and the venue chose to ignore it. A trial court judge disagreed. A “reasonable person,” ruled the judge, would have foreseen the danger. Thus, the judge dismissed the lawsuit. In the panel’s opinion, Roe should never have gone into the dark, wooded area. Concluding the trial court didn’t err in its ruling, the appellate panel ruled in favor of Live Nation and Michigan International Speedway. You can view the opinion below. Featured image by FiDalwood (CC by 2.0).